You save £15.00 that's 38% off! This controller is for use with RGB striplights do create the perfect environment for your room. There are eight main colours that can be set instantly which include red, green, blue, white, orange, cyan, yellow and purple. In addition numerous colours can be created using the fade effect that blends the colours together to create a relaxing environment. The speed in which happens can also be controlled. Each of the standard eight colours can be dimmed using the controller. The controller also has eight types of static modes and six different dynamic modes than range from flashing to various strobing effects. 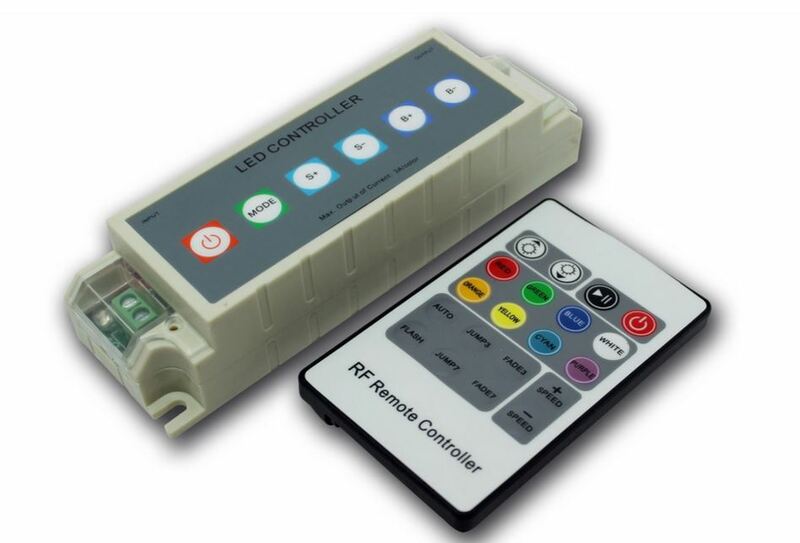 This controller will require a suitable led driver or transformer to input the required power to drive the LED strips. The maximum power output is 108W which will power a 15m continous length of strip lights or three 5m sections rated a 7.2W per meter. A 100-120W transformer would threfore be required as a minimum to provide a sufficent input power to the controller if a 15m length was needed. If the strip lighting is longer than 15m or 108 watts a seperate controller and transformer would be required. For complex arrangements of LED strip lighting we recommend that qualified electrican is consulted and used for installation.